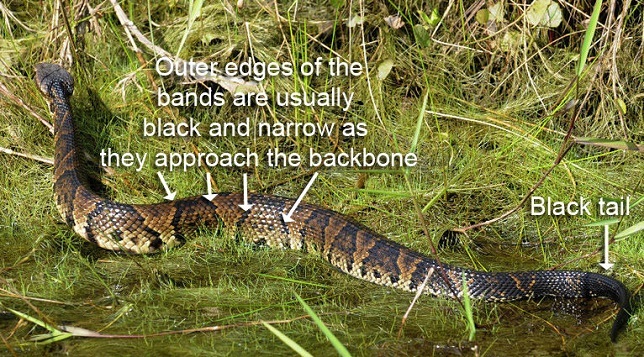 How To Identify A Water Moccasin In 5 Simple Steps - Know It Here! The venomous water moccasin is one of the deadliest snakes you could encounter in the water. It is abundantly found in the southeastern part of the United States and will be most likely found in large river bodies. A close encounter with them might even be deadly and avoiding them is one of the best ways to ensure your safety. They fall under the pit viper family and they have large bodies with triangular heads; however, there are at least one snake with a similar appearance and identifying the snake is one of the best ways to ensure your safety and avoid it. Luckily, the snake has idiosyncratic markings and swimming habits that can be used to identify it if you suspect it might be swimming towards your boat. As a pit viper, the water moccasin has hemotoxic venom that is quite similar to that of the rattlesnake. 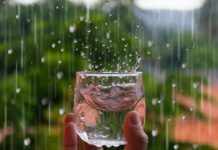 This will directly attach the red blood cells and cause havoc inside the body, with many people actually dying from these bites. Once the poison is in the system, it can actually keep the blood from clotting and hemorrhages if not treated. However, these snakes are not overly aggressive and they only strike when they feel really threatened. 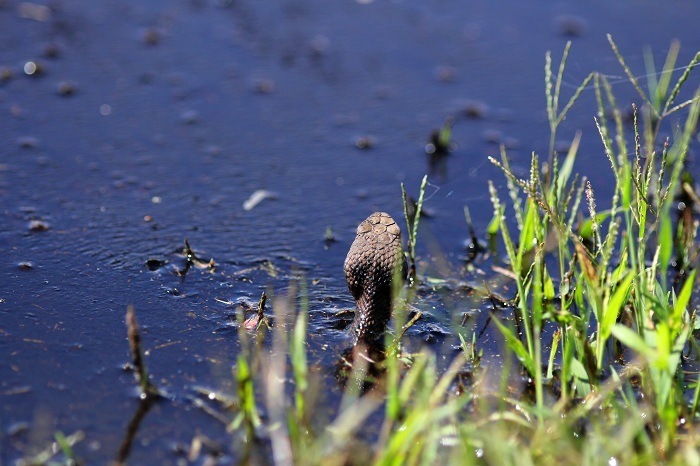 The water moccasin is known as a sly and silent killer and will not be found in your path very often. Nevertheless, if you have been bitten, the symptoms are quite apparent and distinct and you should notice lack of breathing and see the swelling immediately. If you experience these symptoms after a bite, it is best to get medical care as soon as possible. Like the water moccasin, the simple and common water snake will also bite, but there are a few ways for you to distinguish between the two and save yourself from being seriously injured. 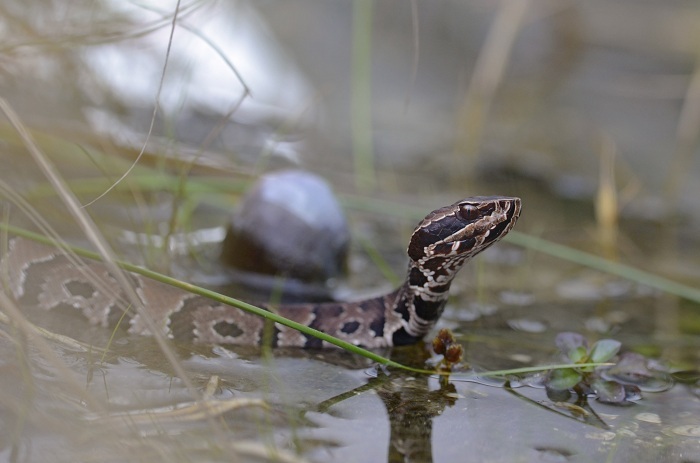 We have done some of the legwork and some additional research to find out which features and habits are prominently found in the water moccasin that you should look out for when encountering a snake in the water. 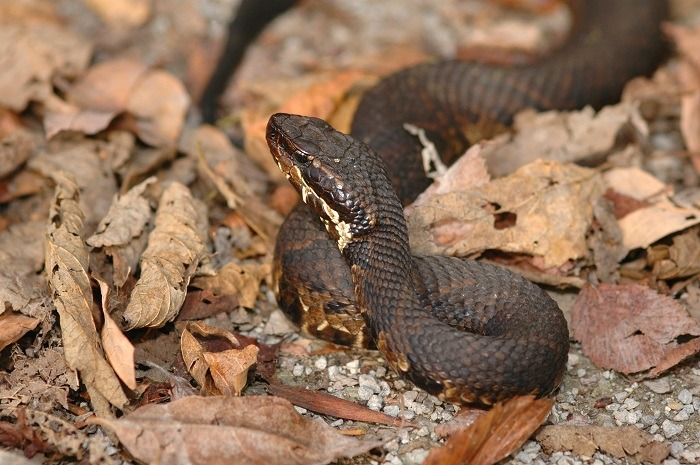 The water moccasin has a brownish color, but this will also go darker as they age more. They are known for their thick bodies and shorter tails compared to the slender water snake. Their heads are also much larger than the normal water snake and they have a diamond-like shape that almost seems like a large block. One of the ways we found to make it simple to distinguish the water snake from the water moccasin is the fact that the water moccasin will look like it has just eaten something. They always look fat and heavy as well. With the water snake, you might find it having a smoother action. This is thanks to the slimmer shape of the body. As we have already mentioned, these snakes are commonly known for their large block-like heads and their heads are thicker than the rest of the body. 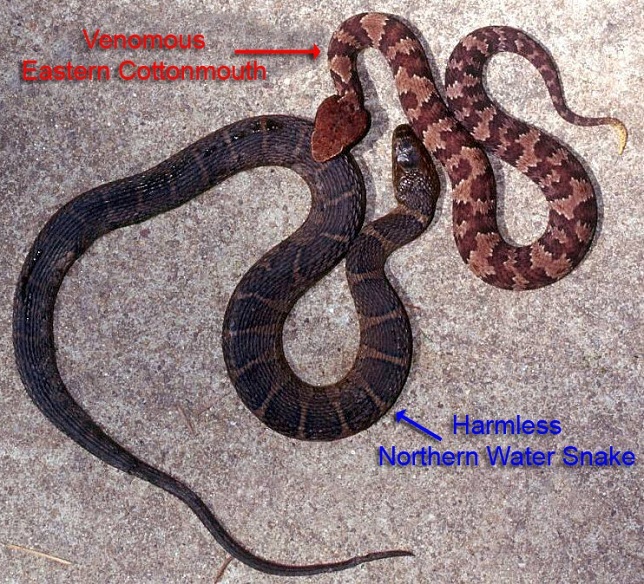 However, many other snakes have the same neck size as their heads, but with the water moccasin, that is not the case. When encountering a water moccasin, you should easily see the neck size that is much smaller than the head and this will be a clear indication that the snake is a water moccasin and not a harmless water snake. While it might not be advisable to get this close to the snake, but if you do manage to have a close encounter, you should also look at the eyes and the nostrils. The cottonmouth or water moccasin has distinct cat-like eyes and they have clearly visible pits underneath the eyes and the nostrils. These pits are actually heat-sensing organs that make the snake part of the pit viper family. Spotting the color variations might not be the easiest of tasks as the snake starts to age, but younger water moccasins generally have darker bands around their light brown bodies. 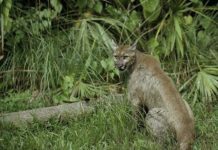 The tails start out with a yellowish color and will eventually turn green into adulthood. As the snake starts to age, the tail will become black and this makes it much harder to see the bands on the snake. These snakes generally have between 10 and 15 darker bands around the body. Generally, these snakes are not all that aggressive and they will not strike immediately if they feel threatened. The water moccasin will emit scents towards of predators and it will try and slip away unnoticed to the closest water body it can find. Before striking, the snake will open its mouth, which reveals a distinct white inside and this is where the name cottonmouth comes from. In the water, these snakes can be tough to spot and with the extra size and weight, their bodies will barely break the surface. You will need to be on the lookout for the head. This could also be a great way of telling if it is a water snake or a cottonmouth as the water snake is much more visible in the water thanks to its lighter weight and thinner composition. The cottonmouth or water moccasin is definitely one of the most dangerous snakes on the planets when it catches you off guard without anywhere to go. The snake is better left alone and with these 5 simple steps, you should be able to identify it and stay clear of it as much as possible. 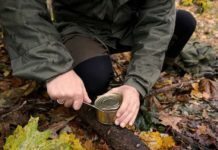 It is also recommended that you do some research on the area if you are hiking or camping to know which snakes are found and how you could spot them. This will be a safe way for you to remain safe as well.